The torque peaks at a lower, more useable 4200 rpm as opposed to the stock car�s 5000 rpm. There�s over 240 ft-lbs of torque as low as 3500 rpm � the stock system doesn�t hit that for another 1000 rpm! Horsepower climbs steadily starting at 3500 with the biggest boost coming at 7200 rpm (+20hp). This system showed greater gains on our dyno than the standard Euro Headers and�Euro�Cat conversion. For an even greater hp gains use the new Supersprint "stepped" header system - now available at a special price! With the Borla mufflers this system is quite a bit louder than the�stock system but still easily tolerated for street use. The Supersprint race muffler system is louder still and recommended only for track cars. There is also a significant weight savings with this system making it perfect for track cars. TheShark InjectorTM software has been specifically designed for cars running�the Euro�headers�but no cats. The software "turns off" the reading from the rear O2 sensors and modifies the tolerances for the EGT sensor. Using this exhaust without the proper software will surely cause a Check Engine light. Because this part modifies the BMW emissions equipment, a Smog Waiver must be signed and on file at TMS before parts can be shipped. Click here to download the Smog Waiver (.pdf file). 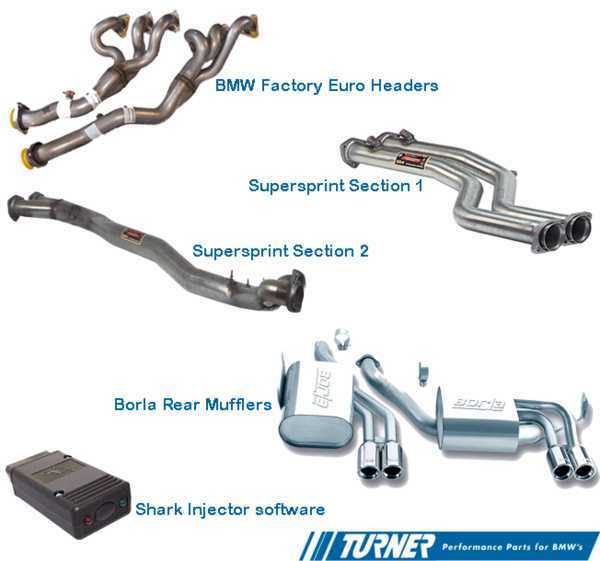 E46 M3 Track/Competition exhaust kit with specially-tuned Conforti Shark Injector TM software. Turner Motorsport has exhaustive experience modifying the E46 M3 and weve put together what we think is the best bang for the buck. Kitincludes Euro M3 headers (Supersprint "stepped" headers are optional), Supersprint straight pipesthat delete the cats and resonators, and a Borla rear muffler system. The torque peaks at a lower, more useable 4200 rpm as opposed to the stock cars 5000 rpm. Theres over 240 ft-lbs of torque as low as 3500 rpm  the stock system doesnt hit that for another 1000 rpm! Horsepower climbs steadily starting at 3500 with the biggest boost coming at 7200 rpm (+20hp). This system showed greater gains on our dyno than the standard Euro Headers and Euro Cat conversion. For an even greater hp gains use the new Supersprint "stepped" header system - now available at a special price! With the Borla mufflers this system is quite a bit louder than the stock system but still easily tolerated for street use. The Supersprint race muffler system is louder still and recommended only for track cars. There is also a significant weight savings with this system making it perfect for track cars. TheShark Injector TM software has been specifically designed for cars running the Euro headers but no cats. The software "turns off" the reading from the rear O2 sensors and modifies the tolerances for the EGT sensor. Using this exhaust without the proper software will surely cause a Check Engine light. Because this part modifies the BMW emissions equipment, a Smog Waiver must be signed and on file at TMS before parts can be shipped.